The Wisconsin court system recognizes that veterans in the criminal justice system face unique issues. Developing strategies that will be effective with this population requires commitment, understanding, creativity and a willingness to build partnerships. Courts across Wisconsin are piloting programs designed to provide better, more effective solutions for veterans in the criminal justice system. Here is a brief history of the effort, along with a county-by-county list of programs. Chief Judge Benjamin D. Proctor (now retired) explains the goals of the Chippewa Valley Veterans Treatment Court at a January 2011 ceremony to open the new court program. The courts have an important role in helping to connect Veterans in crisis with information on services to which they are entitled. When a veteran needs housing support, mental health services, treatment for addiction, job training or other help, the court may work with local experts including County Veterans Services Officers (CVSOs) and Tribal Veterans Services Officers. In January 2009, the Wisconsin Supreme Court's Planning and Policy Advisory Committee (PPAC) began a concerted effort to help connect the state's circuit court judges with these officers to ensure that veterans who find themselves in court are connected with important resources. The Wisconsin Department of Veterans Affairs' directory of CVSOs is available at dva.state.wi.us/cvso_list.pdf. The courts also work with Veterans Justice Outreach Specialists (VJOs). The U.S. Department of Veterans Affairs has asked that each VA medical center designate a VJO to help veterans with case management and serve as liaisons with local justice system partners. In Wisconsin, Veterans Justice Outreach Specialists are available at the VA medical centers in Madison, Milwaukee and Tomah, as well as in bordering states. Current VJOSs are: Edward Zapala (Madison), Abigail Ziebell (Milwaukee), Garrett Hebel (Tomah), Faith Weiss (Minneapolis), Michael Matwyuk (Iron Mountain, Mich.). More information is available on the Department of Veteran's Affairs site (external link). The development of court programs for Wisconsin veterans began when the Office of the State Public Defender and the Wisconsin Department of Veterans Affairs received a federal grant in 2008 to bring Judge Robert Russell—who started the nation's first veterans treatment court in Buffalo, N.Y.—to Wisconsin to tell his story. A short time later, a delegation from Wisconsin visited Russell's court in New York. Soon after that visit, a conference entitled Leave No One Behind: Veterans in the Criminal Justice System was held in June 2009. The Wisconsin court system joined the State Public Defender, Department of Corrections, Department of Justice, Veterans Administration and the Department of Veterans Affairs in co-sponsoring the conference, which brought together judges, prosecutors, public defenders, treatment providers and County Veterans Services Officers from across Wisconsin. Participants developed plans for building specialty court programs in the state. More than 100 people at sites in Madison, Milwaukee and Tomah participated. Since then, 16 court-connected programs covering 33 counties have been developed. The Chippewa Valley Veterans Treatment Court, opened in Eau Claire, serves Chippewa, Dunn and Eau Claire counties. The court focuses on addressing alcohol, drug and mental health issues associated with criminal behavior within the military veteran population. Former Chief Judge Benjamin D. Proctor (now retired)—who was honored as the State Bar Judge of the Year in 2009, in part for his work with veterans—was the first presiding judge in this court. Judge William M. Gabler currently presides. Veterans in Columbia County who need help with civil legal problems such as divorce, child custody, foreclosure and unemployment issues may be eligible for free legal services through the UW Veterans Law Center (see Dane County entry). In October, 2014, the Dane County Veterans Treatment Court conducted its first court session and became the 11th veterans court in Wisconsin. If a veteran has been or is about to be charged with a crime, and it appears that a part of the problem is a need for treatment, the veteran can ask the County Veteran Service Officer to verify his or her eligibility for treatment from the Veterans Administration. The veteran must agree to participate in regular court supervision during a period of treatment. Each veteran is assigned a mentor, a veteran in the community who agrees to keep in touch with the program participant and will assist in figuring out what he or she needs to do to get back on track. Mentors are recruited through local veteran's organizations, college campus veterans clubs and law enforcement agencies. The Dane County Veteran Court is potentially available to veterans at both the pre-disposition and the post-disposition stage. Pre-disposition participants may be able to earn, through full cooperation in treatment, a dismissal or reduction of the charge pending. Post-disposition participants, individuals on probation post-conviction, typically have the opportunity to take part in the court's process as a part of their probationary supervision. The Department of Corrections assigns all such veterans to a single probation agent who actively participates in the veteran court process. The Dane County Veterans Treatment Court has been given the critical support and cooperation of the District Attorney, the Sheriff, the Public Defender, the Department of Corrections, the Veterans Administration and the Dane County Veterans Service Officer. The presiding judge in the Dane County Vets Court is Judge Ellen Berz, Circuit Court, Branch 11, 608-267-8802. Dane County veterans with civil legal problems may receive help through the UW Law School Veterans Law Center. Lawyers, law students and paralegals staff the center, which provides free help with issues such as divorce, child custody, foreclosure, housing issues, unemployment benefits and other civil legal problems. The Law Center serves low-income veterans and their families on a walk-in basis from 11 a.m. - 1 p.m. on the second Thursday of each month at Madison's City-County Building (210 Martin Luther King Jr. Blvd., just off the Capitol Square) and from 10 a.m.  1 p.m. on the fourth Friday of each month at William S. Middleton Memorial Veterans Hospital (2500 Overlook Terrace, Madison). Veterans in Dodge County who need help with civil legal problems such as divorce, child custody, foreclosure and unemployment issues may be eligible for free legal services through the UW Veterans Law Center (see Dane County entry). Veterans in Green County who need help with civil legal problems such as divorce, child custody, foreclosure and unemployment issues may be eligible for free legal services through the UW Veterans Law Center (see Dane County entry). Veterans in Iowa County who need help with civil legal problems such as divorce, child custody, foreclosure and unemployment issues may be eligible for free legal services through the UW Veterans Law Center (see Dane County entry). 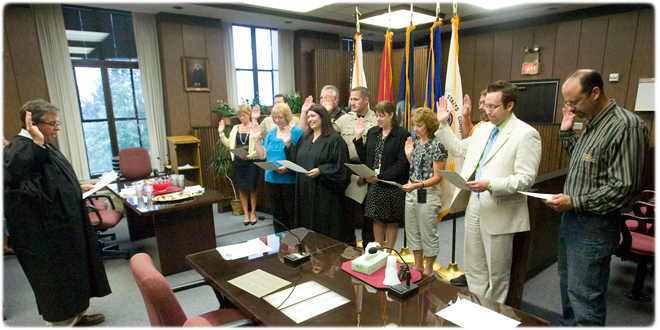 In April 2010, Wisconsin opened its second veterans treatment court program. The Iron County Veterans Court operates under the direction of Judge Patrick J. Madden, who has served on the bench for over 25 years. The primary focus is on drug or alcohol related crimes or other misdemeanors. Iron County feels that these types of crimes may be alleviated by addressing the underlying issues unique to veterans. Each veteran in the program is assigned a mentor; the mentor program is managed by County Veterans Services Officer Erick Nasi. Contact: Erick Nasi, Veterans Services Officer, (715) 561-2190. Veterans in Jefferson County who need help with civil legal problems such as divorce, child custody, foreclosure and unemployment issues may be eligible for free legal services through the UW Veterans Law Center (see Dane County entry). On Veterans Day 2010, after more than a year of preparation and planning, the La Crosse Area Veterans Court opened its doors. It was the third program of its kind in Wisconsin. The program focuses on early identification of Veterans in the criminal justice system to facilitate connection with available services as quickly as possible. The program also collaborates with the La Crosse Area Veterans Mentor Program, which is a non-profit entity, to make use of trained mentors to help Veterans facilitate appropriate changes in their lives. Presiding is Judge Todd W. Bjerke, a retired U.S. Army Reserve colonel and U.S. Marine Corps Veteran, who was first elected to the bench in La Crosse in 2007. Contact: Helen Kelly, (608) 790-6265. In Milwaukee County, the Wisconsin State Public Defender's Office, the Milwaukee County District Attorney's Office, and the Department of Veterans Affairs (VA) have developed a multi-faceted program to serve veterans involved in the criminal justice system. The Veterans Treatment Initiative officially launched on Dec. 5, 2012, with a veterans court docket scheduled on Wednesday mornings. Currently, the Veteran Treatment Initiative proceedings occur in front of Milwaukee County Circuit Court Judge Carl Ashley, Branch 33, Safety Building, Room 113, 821 W. State Street, Milwaukee. Cases are screened to determine whether a deferred prosecution or deferred sentencing program, the Veterans Track in Drug Treatment Court, or supervision by the Department of Corrections is the best option. Most of these programs offer an opportunity to have a charge dismissed or reduced if the offender abides by a certain set of conditions. When working with the VA, the Veterans Justice Outreach specialist (VJO) helps link the individual to VA treatment and often reports on compliance with VA treatment programs. To apply to the Veteran Treatment Initiative, contact Veteran Treatment Initiative Court Coordinator Jake Patten at jake.patten@cvivet.org; or (414) 431-2334. The Milwaukee program also matches veterans with mentors through a non-profit veterans services group called Dryhootch, LLC. Mentors (who are also veterans) meet with the veteran at and between court appearances to provide peer support services and assist with access to ancillary services. Dryhootch also offers a Family Legal Clinic where veterans and their families can receive free legal advice on non-criminal matters such as divorce, child support, visitation and more. The clinic runs in the evening on the first and third Thursday of each month. For more information, visit the Dryhootch site (external link) or call (414) 763-2785. The Northeast Wisconsin Veterans Treatment Court is a collaborative problem-solving court that opened in March 2012. The program pairs a circuit court judge, representatives of the Veterans Health Administration and Veterans Benefit Administration, the District Attorney's Office, the Public Defender's Office, veterans service organizations, the U.S. and Wisconsin Departments of Veterans Affairs and many other community partners. It assist veterans who accept responsibility for qualifying felony or misdemeanor offenses committed within a group of counties in northeast Wisconsin (the Eighth Judicial District). The program also offers assistance with treatment, rehabilitation, employment and housing. The court serves Brown, Door, Kewaunee, Marinette, Oconto, Outagamie and Waupaca counties (Waupaca County also has a stand-alone veterans court program). Contacts: Beau Liegeois, Brown County assistant district attorney, (920) 448-4190; Jerry Polus, Brown County veterans service officer, (920) 448-4451; Tom Hinz, mentor and resource coordinator, (920) 606-2012. Outagamie County Circuit Court Judges John A. Des Jardins and Gregory B. Gill Jr., Outagamie County District Attorney's Office, Wisconsin State Public Defender's Appleton Office, Wisconsin Department of Corrections, Outagamie County Sheriff's Department, Outagamie County Veterans' Service Office, Outagamie County Volunteers in Offender Services Office, and the John Bradley VA Outpatient Clinic. The mission of the Outagamie County Veterans Court is to promote public safety, and assist and support veterans and their families by creating a coordinated response through collaboration with the veteran's service delivery system, community-based services, and the criminal justice system. Each veteran is paired with a mentor from the same branch of service, who understands and supports the veteran court requirements, and assists the veteran in complying to make progress and achieve success. The focus of the Veteran's Mentoring Program is to support the veterans through their readjustment to civilian life, to assist the veteran navigate through the court, treatment and VA systems, to act as a friend, mentor, advocate, and ally through this difficult period, and to ensure that no veteran is left behind. Outagamie County also takes referral from surrounding counties. Contact: Annie Levknecht, Alternative Treatment Coordinator (920) 832-5098. Second Judicial District Chief Judge Mary K. Wagner, Kenosha County Circuit Court, swears in the Veterans Treatment Court team, which includes Racine County Circuit Court Judges Gerald P. Ptacek and Michael J. Piontek (far left). In September 2009, Wisconsin opened its first veterans treatment court program under the direction of Judge James P. Daley, a retired brigadier general in the Wisconsin Army National Guard and decorated Marine veteran of the Vietnam War who has served on the Rock County Circuit Court for 25 years.. Currently, Judge Wood presides over the Veterans Court. The court serves veterans in Rock and adjoining counties who are charged with crimes and who have PTSD and/or TBI issues. Each participant is matched with a mentor of similar military background. Prior to participating, each mentor completes a training program. The court will also accept cases diverted from nearby counties. Judge Daley and two members of the veterans court team explained during a WisconsinEye interview (external link) how the Rock County veterans court operates and why it is significant for veterans and the court system. Veterans in Rock County who need help with civil legal problems such as divorce, child custody, foreclosure and unemployment issues may be eligible for free legal services through the UW Veterans Law Center (see Dane County entry). Veterans in Sauk County who need help with civil legal problems such as divorce, child custody, foreclosure and unemployment issues may be eligible for free legal services through the UW Veterans Law Center (see Dane County entry). The Second Judicial District Veterans Treatment Court serves veterans in Kenosha, Racine and Walworth counties. The program seeks to divert eligible veterans (veterans with substance dependency and/or mental illness who are charged with felony or misdemeanor non-violent criminal offenses) to a specialized criminal court docket. The court uses a treatment problem- solving model. Eligible veterans are identified through screenings. Participants voluntarily take part in a treatment plan that is supervised by a judge. The plan is developed by a team of court staff, veteran health care professionals, veteran benefit professionals, county veteran service officers, veterans organizations, substance abuse health care professionals and mental health professionals. At regular status hearings, which are held at the Racine County Courthouse, treatment plans and other conditions are periodically reviewed for appropriateness, incentives are offered to reward compliance with court conditions, and sanctions for non-compliance are imposed. 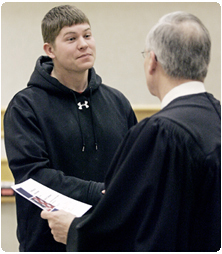 The Sheboygan Area Veterans Court opened its doors in August 2012 and focuses on helping veterans who are charged with crimes and who have been diagnosed with mental health issues and/or drug or alcohol addictions. The program hears cases from Fond du Lac, Calumet, Manitowoc, Ozaukee, Sheboygan, Washington, and Winnebago counties. Contact: Charlene Cobb, veterans services officer, (920) 459-3053. In Waupaca County, defense attorneys, prosecutors and judges working with treatment providers at the Wisconsin Veterans Home at King have established a legal assistance program for veterans. The program works with law enforcement to emphasize early identification of veterans. Those identified are referred to the Veterans Assistance Program for assessment. In appropriate cases, deferred prosecution agreements are sought to give the veteran a chance to obtain needed services. Legal assistance is provided pro bono through local attorneys. Contacts: Atty. Tom Maroney, (715) 258-5990; Steve House, Veterans Assistance Program, (715) 256-1118. The Wisconsin Veterans Intervention Program (WI-VIP) is an initiative of the State Public Defender's Office. The program encourages creation of veterans court programs in Wisconsin and supports them once they are established. WI-VIP also works with the Department of Corrections to identify veterans currently in an institution or on probation/parole in order to ensure that each veteran is connected with available services. Contact: Peter Anderson, liaison for WI-VIP in the Wisconsin's State Public Defender's Office, (608) 267-0581. There are programs to help Wisconsin veterans and active-duty servicemembers who need legal advice. The Wisconsin Legal Assistance for Military Personnel program (www.wisbar.org/lamp) is a project of the State Bar Volunteer Lawyers Program. The program provides free legal assistance for qualifying veterans, active duty military personnel, and National Guard and Reserve members. The Marquette University Law School has established a legal clinic for veterans. More information about this legal clinic is available on the Marquette Volunteer Legal Clinic website. A program called Dryhootch offers a Family Legal Clinic where veterans and their families can receive free legal advice on non-criminal matters such as divorce, child support, visitation and more. The clinic runs in the evening on the first and second Thursday of each month. For more information, visit the Dryhootch site (external link) or call (414) 763-2785. The American Bar Association Military Pro Bono Project (external link) connects active-duty military personnel to free legal assistance with civil (non-criminal) legal problems. Referrals are made only by military legal assistance (JAG) attorneys. The UW Law School Veterans Law Center provides free help with issues such as divorce, child custody, foreclosure, housing issues, unemployment benefits and other civil legal problems. The Law Center serves veterans and their families on a walk-in basis from 11 a.m. - 1 p.m. on the second Thursday of every month at Madison's City-County Building (210 Martin Luther King Jr. Blvd., just off the Capitol Square) and from 4-6 p.m. on the fourth Thursday of every month at Porchlight, Inc. (306 N. Brooks St.). Contact: UW Law School Pro Bono Director Ann Zimmerman, (608) 890-3754. This overview will continually grow and change. We encourage those who have additions and updates to contact us at (608) 266-1298.